Cut by Amir Naderi, a visual love poem for the cinema set in the world of the yakuza, will be the opening film in the Orizzonti section at the 68th Venice International Film Festival (31 August – 10 September 2011), directed by Marco Mueller and organized by the Biennale di Venezia chaired by Paolo Baratta. In addition, the selection has been made for the international Jury of Orizzonti, which will be chaired by Chinese director, producer and screenwriter Jia Zhang-Ke, one of the leading figures of Chinese independent film, and winner of the Golden Lion at the Venice Film Festival in 2006 with Sanxia Haoren (Still Life). The other jury members are the curator of the film section of the Tate Modern in London, Stuart Comer; French architect Odile Decq; Egyptian producer and director Marianne Khoury; and Italian film editor and director Jacopo Quadri. In his new film Cut, which he wrote and directed, the founding father of New Iranian Film Amir Naderi (who has lived and worked in exile in New York for over two decades) returns to Venice three years after his previous feature-length film, Vegas: Based on a true story, screened in Competition in 2008. Cut will be presented in a world premiere screening on the Lido on Thursday 1 September 2011 and will compete for the prizes reserved for feature-length films (the Orizzonti Prize and the Special Jury Prize – Orizzonti), in this section, which is open to all “custom-format” works, with a wider view towards new trends in the expressive languages that converge in film. Amir Naderi explained: “The story of Cut comes from my own experience as a filmmaker. Also after meeting and talking to the Japanese actor, Hidetoshi Nishijima, the character of Shuji formed in my mind. Another temptation of making a film in Japan is working with Japanese actors, whom I believe have a very special style and manner in front of the camera. I hope that after working with Japanese people while making Cut, I can get closer to the spirit of the country. Japan is like a modern poem for me. I respect Japanese cinema and have no intention of critiquing it in my story. Among the great filmmakers of the world today, there are two Japanese filmmakers: Kiyoshi Kurosawa and Sabu. I believe that the feeling and the power of the great Japanese filmmakers will support me in this particular film”. Cut was written and directed by Amir Naderi, and co-written by Shinji Aoyama and Yuichi Tazawa; it stars Hidetoshi Nishijima, Takako Tokiwa, Takashi Sasano, Shun Sugata, Denden. The director of photography is Kejij Hashimoto, the production design is by Toshihiro Isomi, and the sound by Takeshi Ogawa. Kiyoshi Kurosawa served as special consultant. Cut is produced by Sadai Yuji with Eric Nyari, Engin Yenidunya, Regis Arnaud, Shohreh Golparian. 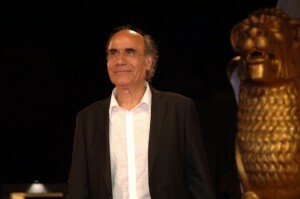 Amir Naderi is one of the most influential figures of Iranian cinema. He developed his early knowledge of cinema by watching films at the theater where he worked as a boy, reading film criticism, and establishing friendships with leading film critics. He began his career with still photography for several important Iranian feature films. In the Seventies, Naderi turned to directing, making some of the most important films in New Iranian Cinema. In 1971, he made his directorial debut with Khoda Hafez Rafiq (Goodbye Friend), but it was Tangsir (1973) that brought him great popularity in Iran. Naderi then came into the international spotlight with films that are now known as cinema classics, Entezar (Waiting, 1974), winner of the Jury award at Cannes, Davandeh (The Runner, 1985), presented in Venice, and Ab, Bad, Khak (Water, Wind, Dust, 1989), presented at Locarno. The Runner is considered by many critics to be one of the most influential films of the past quarter century. After expatriating to New York in the early Nineties, Naderi continued to produce new works and was given many important positions. He was named a Rockefeller Film and Video Fellow in 1997, and has taught at Columbia University, the University of Las Vegas, and at the New York School of Visual Arts. His American films have premiered at the Film Society of Lincoln Center, at MoMA’s New Directors/New Films series, at the Venice, Cannes, Tribeca, and Sundance Film Festivals. His film Manhattan by Numbers (1993) was presented at the Venice International Film Festival, Sound Barrier (2005) had its premiere at the Tribeca Film Festival and his last feature film Vegas: Based on a True Story (2008) was in competition at the Venice Film Festival, where it won the CinemAvvenire and SIGNIS awards. The five members of the international Jury have been named for the Orizzonti section, which will award four Prizes, with no shared awards permitted: Orizzonti Prize and the Special Orizzonti Jury Prize (for feature-length films), the Orizzonti Short Film Prize, and the Orizzonti Medium-length Film Prize. Chinese director, producer and scriptwriter Jia Zhang-Ke (Jury President). In 2006, his work Still Life (Sanxia Haoren) received the Golden Lion at the 63rd Venice International Film Festival. In 2007 he was again in Venice with Useless (Wuyong), which won the Orizzonti Doc Award for the best documentary in the Orizzonti section. These works were followed by 2008’s 24 City (in Cannes competition) and 2010’s I Wish I Knew (in Cannes’ Un Certain Regard). In 2010, Jia Zhang-Ke was awarded the Leopard of Honor at the 63rdFestival del film Locarno, the youngest filmmaker ever to receive this honor. After attending the Beijing Film Academy in 1993, he made his first feature film Xiao Wu in 1998, and won the Wolfgang Prize and Netpac Award in the Forum of the 48th Berlin International Film Festival. Jia capitalized on his success with three internationally acclaimed features: Platform (Zhantai, 2000, in Venice competition), Unknown Pleasures (Ren xiao yao, 2002, in Cannes competition), and The World (Shijie, 2004, in Venice competition). the curator of Film at Tate Modern, London, Stuart Comer. He oversees film and video work for the Tate Collection, runs the Tate Film programme, is co-curator of the inaugural season for the Tate Modern Oil Tanks in 2012, and organizes an extensive programme of screenings, performances, forums and lectures focusing on current cultural issues and the history of artists’ film and video. He is editor of Film and Video Art (Tate Publishing, 2009) and has contributed to numerous periodicals, including Artforum, Frieze, Afterall, Mousse, Parkett and Art Review. He has contributed essays to catalogues on various artists and has been a member of numerous international juries. Recent freelance curatorial projects include ‘Andy, as you know I am writing a movie…’ at the Beirut Art Center, ‘An American Family’ at CASCO, Utrecht and Kunstverein Munich; and ‘Double Lunar Trouble’ at the Whitechapel Art Gallery, London. He was co-curator of the 2007 Lyon Biennial. Internationally renowned French architect Odile Decq. After her first major commission, the “Banque Populaire de l’Ouest” in Rennes (1990), she obtained numerous prizes, and publications that distinguished the building underlined the emergence of a new talent directly born from the punk rebellion which turned old conventions on their head. The “Odile Decq Benoît Cornette” office (ODBC) has been awarded a Golden Lion in Venice in 1996 at the Architecture Biennale. In 2010 Decq completed the MACRO (Museum for Contemporary Art in Rome). Elected General Director of the Ecole Spéciale d’Architecture in Paris in 2007, she shares her time between her architectural office ODBC and the School, organizing and developing it to an international level. In 2012, the FRAC (Fonds Regional d’Art Contemporain) in Rennes and the GL Events headquarters in Lyon will be completed. Egyptian producer and director Marianne Khoury. Captivated by ‘auteur cinema’, she produces independent films that go against the grain of Egyptian cinematic themes. Since 1984 she has been a managing partner in Misr International Films (Youssef Chahine & Co.) as well as an executive producer on a large number of co-productions directed by the legendary auteur, Youssef Chahine. Khoury has also collaborated with other directors, producing their first or second film, namely Yousri Nasrallah, Asma El Bakri, Radwan El Kashef, Atef Hetata, and Khaled Youssef. In 1999 she directed her first documentary film, The Times of Laura, followed by Women Who Loved Cinema in 2002, both of which won critical recognition for their study of the ground-breaking work achieved by renegade women in Egypt nearly a century ago. Women Who Loved Cinema was part of Women…Pioneers (2000-2004), a series of documentary films about pioneering women in the Arab world. In 2010 with Mustapha Hasnaoui she co-directed Zelal, a feature film presented in the Orizzonti section at the 67th Venice Film Festival, which later won the FIPRESCI award at the Dubai Film Festival. Italian film editor Jacopo Quadri. He has worked on over fifty full-length feature films and documentaries in Italy, France, Great Britain, Argentina and China. He is the editor of Bernardo Bertolucci’s more recent films and of all of Mario Martone’s. He has collaborated, among others, with Marco Bechis, Paolo Virzì, Zhang Yuan, Apichatpong Weerasethakul, Gianfranco Rosi, Francesca Archibugi, and Cristina Comencini. Over the years, Quadri has presented his work in Venice on several occasions, starting in 1992, when Death of a Neapolitan Mathematician won the Special Jury Prize at the 49th Venice Film Festival. In recent years he was in Venice with Below Sea Level by Gianfranco Rosi, winner of the Orizzonti Doc Prize for Best Documentary and of the Doc/It award. In Orizzonti, and again with Director Gianfranco Rosi, last year he presented El Sicario – Room 164, a documentary that subsequently won awards at various international festivals, and with We Believed (Noi credevamo) by Mario Martone, presented in competition. His work as a film editor has won him numerous awards such as his four Ciak d’oro – the most recent this year for We Believed by Martone, as well as a David di Donatello in 1999 for Rehearsals for War (Teatro di Guerra, Mario Martone).